A mini stepper is an interesting device that is very useful in several, different ways. It is small, so it doesn’t use a lot of space, which makes it perfect if you live in a small apartment. On the other side, it is similar to a big cousin, so it offers similar benefits. Burning calories will be improved, so you can expect an actual weight loss. However, the weight loss progress will be lower than with a full sized stepper. In any case, this simple gadget is something you should use, if you are planning to burn more calories and to lose weight. The most important fact is to know that this device doesn’t offer a quick progress, so you shouldn’t lose hope and you should exercise every time you have an opportunity. All you need to do is to place your feet on the paddles and pull the handles with your hands. The procedure is the same as with a full sized stepper. 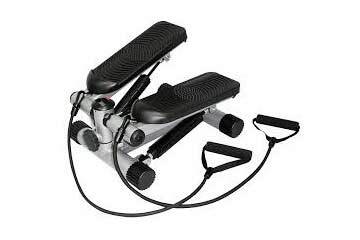 In addition, you can adjust the tension, so you can make the exercising harder. This should be used only when you are ready, or your muscles will hurt. Some models have amazing settings, so you can make the exercising a lot harder, which means that you will burn more calories and lose more weight in a shorter period of time. Exercising should be done a few times per week, but in this case, the more you exercise the bigger and better effect you will get. Keep in mind that exercising every day, will have the best benefits to your weight loss progress. You can burn up to 100 calories while watching your favorite TV show. In addition, the latest models come with a display that monitors the amount of burned calories. According to experts, these mini steppers are a lot better than most other products of this type, simply because they allow you to see the actual number of burned calories, so you can adjust your diet and make the progress more effectively. A useful trick that is more than simple is to increase your weight, by holding dumbbells in your hands. This simple trick is useful due to the fact it will help you burn calories, so the progress will be better and quicker. The amount of weight you hold depends on you. You can start with 1 kg and add more when you are ready. Reaching 10 kg means that your progress is going incredibly fast and you are moving towards the goal. On the other side, don’t add weight unless you are completely ready, or you can cause injuries. The time you are going to need for exercising is about 10 minutes, but it can be longer, due to the fact this is an easy exercise. The first results are going to be noticed after 2 weeks, if you exercise every day. On the other side, keep in mind that the diet should be adjusted as well, so you should reduce the intake of calories per day.